Why Yoga with Horses? Is It Just Another Gimmick? Dancer Pose, Yoga with Horses class. So many of you have probably wondered, what is this thing, Yoga with Horses? All these pretty photos doing acrobats on a horse. Is it real, or just for show, another gimmick? It’s none of that, though it certainly does make for some beautiful photos, but those are just a means to convey to the world a message of what else we can be to our horses, that doesn’t involve making them do things they don’t want to, how we can create safe moments of well- being together. It's essentially about learning to live in the moment, in the here and now, just as horses do. It helps us to be better equestrians, better humans, and helps us find our way in life, our purpose, our path. A journey of Self Realization through Yoga and the Way of the Horse. The goal of a Yoga practice is to develop self awareness. It is a path to Self- Realization. Yoga with Horses enriches this journey, helps us to connect with nature, with earth, teaches us to live in the moment, to enjoy fully what is happening right now, without judgement, without expectations. As it so happens, the basics of yoga are also the basis of what you need to connect with a horse. The practices feed off each other, and ease your path of self discovery. There is a saying Happiness equals reality minus expectation. Horses have so much to teach us in this domain, if we can learn to let go, be still for a moment they will lead you to a healthier more balanced and harmonious way of living your life. For many it is life changing as you discover who you truly are and why you are here. 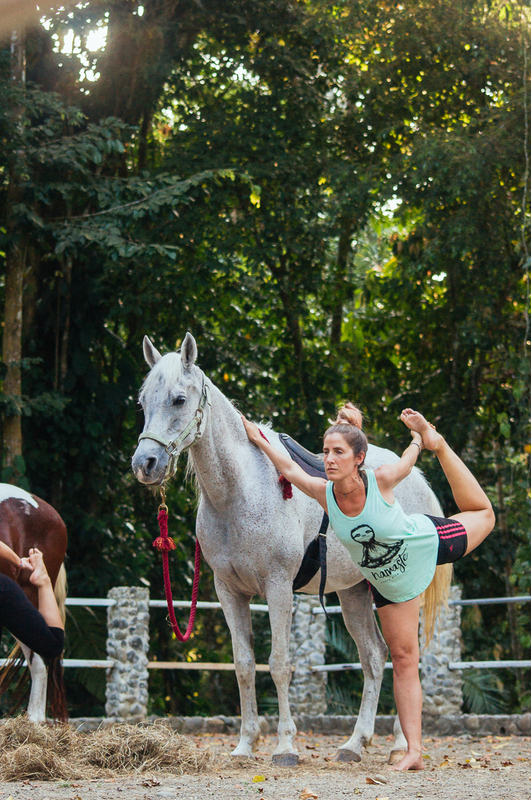 Yoga with Horses can be for everyone, wherever you are in your life and whatever you do, you can enjoy this practice. As in Yoga, you begin where you are that day, that moment. It can be for the professional rider or pleasure rider a way to strengthen their bodies through the yoga poses and find balance and awareness. Pranayama, breath techniques, to control our energies and bring harmony to our emotions, can calm and bring focus to what we are doing. Meditation can help us to become in tune with who we are and to connect at a deeper level with our horses. For the practicing Yogi, it can be a new transformational journey to self awareness through way of the horse. Discovering a new sense of who you are. Horses are sentient beings and connected to all the energy that surrounds them. They mirror our emotions, especially the ones we hide deep inside. They can help us connect with our inner selves and guide us on a path to healing, to Self Realization. For the beginner in both yoga and riding, and for those who are looking for a deeper connection and meaning in life, you can begin a path of healing, of Knowing Yourself. It is a moment we share together, in stillness. An active stillness created through quieting the mind chatter through meditations, being in touch with our emotions and energy through pranayama (breathing techniques), body strengthening and stretching through the practice of asanas (yoga poses). By quieting our minds we can focus better on what is happening in the moment, which helps us to be a better equestrian wether in competition, pleasure or just hanging out with the horses in the pasture. We surrender to the moment without worrying about the outcome, without expectations. This actually helps us to perform better, as we are focused and centered which in turn helps our horse to also be focused and centered. By learning how to understand our subtle energies and how they influence ourselves and the horse, we begin to use our body language in better and more subtle ways to influence the horses energy and movement in harmony and to calm our own energies and emotions. By strengthening our core, adjusting our body alignment through the practice of yoga asanas, we become aware of each part of our body, how to relax the muscle, how to stretch and release, how to tighten and strengthen when needed. Heightening our body awareness and balance helps us to communicate clearly and with little effort to our horse. Pranayama helps to calm ourselves and our horses, create better focus and presence and it can also influence our energy level as well as the horse’s. We can ask our horse for a halt or to slow down on the inhale, on the exhale for forward movement and turning or changing gaits. Horses are extremely sensitive and soon realize that we are using our breath to communicate with them and respond very quickly to this. They are always in the moment, always aware to the slightest change of breath, energy and movement, as prey animals this is what has kept the safe and alive. As humans we have become disconnected to these subtle energies and movement, through Yoga we can learn how to control our breath, use our subtle energies and become aware of our body language. These are the useful benefits, but even more important is how it can create a deeper connection with our horse. When we can quieten the mind chatter, the busy thoughts and to do lists, and begin to live in the here and now, the horse is there waiting for us. They are masters of living in the moment. By sharing time together, “doing nothing” we open the door to a deeper connection and understanding. By allowing the allowing to happen we flow towards inner awareness, understanding and union. It can also be incredibly healing the time we spend together with horses. The daily stress and worry we have in life, the anxiety and fear of the future, the regrets and frustration of the past, leave us unbalanced, in dis-harmony which can lead to dis-ease. Being in the presence of horses and meditating, our energies become re aligned as blockages are released and we let go of negative thoughts and energies we no longer need. It doesn’t matter if you are an experienced Yogi, an accomplished rider or a beginner in one or both. It doesn’t matter if you are an experienced Yogi, an accomplished rider or a beginner in one or both. Beginning a path of healing with Yoga and Horses, can transform your life and make it more meaningful. It will touch you in your daily life with your family, friend and business relationships, in how you work and how you take care of yourself and others. It will also transform your horses life, as he begins to feel your stillness, your quiet mind and how you are more aware of your surroundings and what is happening right now. You are no longer busy texting someone, looking at Instagram, thinking of the groceries you need to buy, the fight you had with your partner, what time you need to be somewhere. You are present, focused and aware. This makes the horse feel safer. When a horse feels his person, his rider is not present, is stressed and somewhere else, he feels he needs to be in charge because that person is not paying attention to that scary tractor or wind rustling the leaves, so he takes over, spooks, runs, fights back, becomes worried and frustrated. This is what many call a horse that is misbehaving, when actually he is just being a horse. But when the person is present, soft gaze calmly aware of all that is around them, the dog barking, a ball going by, the horse feels, oh they saw that heard that too, they can remain calm, all is well I can trust that person to be a good leader to follow. Your horse feels safer and YOU ARE safer. There is a very important Yoga moral guideline, Ahimsa, the first of the Yamas (moral constraints), meaning to do no harm. In our time spent with horses, as we practice yoga, in everything we do and how we care for our horse, this Yamas must always apply, always ask yourself, am I harming or hurting my horse physically, emotionally or spiritually in anyway? Am I hurting myself in any way, putting myself in danger? Under no circumstance should the horse, or yourself, be harmed or feel uncomfortable. We must always respect our horses needs and our needs in the moment. If today he is not feeling well or wants to be grazing with the other horses, that's okay. We can go and share space together, meditate, do mandalas, read, but we respect his space and his needs. The same applies to ourselves. When we practice yoga together, we invite them, we spark their interest through being our true authentic selves, being quiet, still, in the moment, our mind awakened and listening. In this spaces horses feel they can be heard, they become curious and want to hang out with us, our energy feels good to them. We are all energy, we are all connected. Life is all about connections and connecting. So breathe, be still and open your mind to the possibilities of just Being and feel your connection to all that is.